Due to space limitations and the need to keep the visual pollution of too many antennae to a minimum I required antennae that are able to cover multiple bands. A dual band J pole had been in the back of my mind for a number of years, the simplicity of this design and the fact that it was ground independent, that is requiring no ground plan radials made the J pole the choice. The proposed antenna would be operational over the entire 6Mtr band (50 - 54MHz) and the entire 2Mtr band (144 - 148MHz), slightly favouring the upper half of both bands. The J pole is simply a half wave length vertical element with a folded quarter wave match stub. The sub doesn’t receive or radiate any energy; it is simply a way of picking off a desired feed impedance. An impedance transformer. The main element of the antenna is a 5Mtr length of 30mm diameter aluminium tube. The 6Mtr & 2Mtr band stubs are attached with a fabricated mounting plate using stainless steel hose clamps. This has several advantages. No drilling into the main elements that may weaken the structural integrity of the antenna, Infinite adjustment opportunity and if and when the antenna is no longer require it can be more easily recycled into the next project. Above all, it appears neat and sturdy. The RG213 coax is installed within the main element and exits above the feed point connection. It is important to protect the coax with rubber grommets where it exits the tube. stubs or 1/4 wave matching stubs, 0.75, 0.50 Or 0.25 respectively. mounting section = The amount of extra physical material required for mounting. The 6Mtr band stub mounting plate. 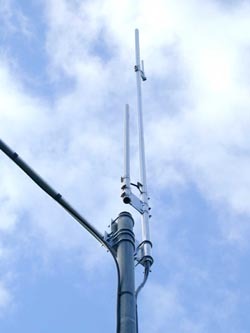 The simple J pole antenna is capable of excellent results as the below antenna computer modelling of a 2M band J pole antenna illustrates. The above radiation plots were produced using MMANA Antenna Analyser software by JE3HHT, Makoto (Mako) Mori. The 1990 ARRL Hand Book.